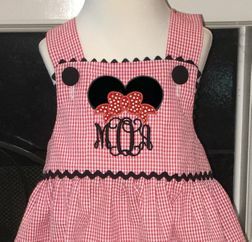 This is our adorable monogrammed Minnie Mouse dress or swess top (2 inches longer than a swing top) and shorts or capris outfit in red gingham seersucker. 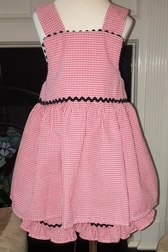 We craft a "Callie" square neck style dress/top and trim the neck, bodice and bodice/skirt seam with black ric rac. 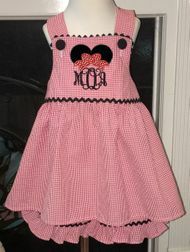 The bodice is monogrammed with your little girl's initials under Minnie Mouse ears and bow. The shoulders of the dress/swess top button with black fabric covered buttons. If you choose a 2 piece outfit, the swess top is paired with the same fabric shorts or capris trimmed above the ruffle with black ric rac.